Good Drivers Can Save 25% ! Usage Based Insurance (UBI) - The Smart Way To Save! Usage Based Car Insurance Saves Good Drivers Money! With Usage Based Insurance, you can make your good driving habits pay off with significant car insurance savings. UBI or Usage Based Car Insurance recognize your good driving habits and reward you for it in the form of an insurance discount and cost savings. Why Sign Up For A Usage Based Car Insurance Program? Immediate savings : Many insurance providers will provide you with an immediate discount just for signing up for usage based insurance. Even more savings : Save up to 25% on your car insurance rates for good driving habits. It’s easy to set up : Simply plug the data collection device into your vehicle or download the app from your insurance provider. Good driving = savings : Get rewarded for the good driving habits and safe driving you already do. You're in control : You pay auto insurance rates based on how you drive, not others, giving you more control over insurance costs. IT'S RISK FREE : No matter how you drive, your premiums WILL NOT increase based on the data collected. Call toll-free 1-855-550-5515 to get a quote or learn more about your options for usage based insurance in Ontario. The concept of paying for a product as you use it is not new, it’s just new to the insurance industry. Usage based car insurance, also commonly referred to as telematics, pay per use insurance, UBI, and pay as you drive (PAYD), is the newest way to save money on your auto insurance rates. It is an extension of telematics technology that determines car insurance premiums based on driver behavior. It rewards safe drivers for their good driving habits in the form of an insurance rate discount. How Does UBI Work? What Does It Track? 1. Using a UBI app : Simply download it onto your smartphone. 2. Installing a device in your vehicle : Sign up for usage based insurance and your insurer will mail you the device to install in your vehicle. Time of day you drive. Your speed – relative to the posted speed limits. Your insurance provider uses this data to gain an overall picture of your driving habits. They assign a score based on your driving, and your score is used to determine your discount for the defined time period. How scores and discounts are applied will vary by insurance company. Talk with your insurer directly for more information. How Is The Data From Usage Based Insurance Used? The data collected by your insurance provider is used to measure your driving habits and assign a discount. It is NOT used to change your current insurance premium, cancel your policy, increase your premiums, or to refuse policy renewal. Additionally, the information cannot be used by police, and all your data is protected under Canada’s Personal Information Protection and Electronic Documents Act (PIPEDA). What Are The Benefits Of Using Pay Per Use Insurance? Good drivers are rewarded for safe driving practices. It provides drivers with tips and information about their current driving practices – information that can be used to improve their driving. Your insurance rates will better reflect your current driving habits. It can assist with accident investigations. For new and young drivers, telematics can be a good driving tool to help them become better drivers. It can also help them lower their rates at a time when they tend to be the highest, something that will also benefit parents who have teen drivers on their insurance policy. Can My Insurance Premiums Go Up If I Have Usage Based Car Insurance? No. Usage based auto insurance will not increase your insurance premium. What it will do is help you save more money when your auto insurance policy comes up for renewal. 20% of drivers used telematics in 2015, up from 13% in 2013. Millennials are 44% more likely than the average consumer to use a device. By 2020, 90% of new cars will have on-board telematics technology. It is used to track where you drive. Driving habits are monitored to increase your insurance premiums. Data will be used to prove you were to blame for an accident. You will be penalized if you drive at certain times. Telematics interferes with your car. Installing a usage based insurance device will void your car warranty. Cars with telematics are a target to be hacked. Insurance companies gather additional data about your driving. These are only some of the many myths about usage based car insurance in Ontario. Usage based auto insurance is the future of the insurance industry. It has already become widely adopted in the UK and is growing at a rapid pace in the United States. Vehicles are now being designed with built in telematics; and as we mentioned above, by 2020, 90% of new vehicles with have telematics technology. This will only make it easier and more cost effective for insurers to offer usage based insurance products and easier for drivers to add it to their current policy. According to a report by IHS Automotive, globally distributed UBI policies will balloon to 142 million by 2023, up from 12 million in 2015 and a mere 7.7 million in 2014. ThinkInsure is pleased to offer usage based insurance in Ontario to drivers. 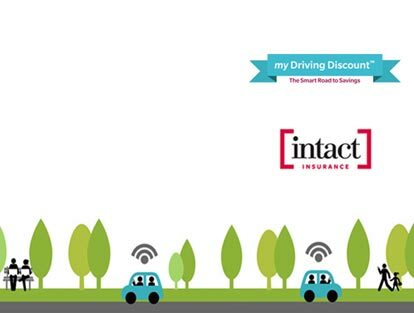 Through the Intact my Driving Discount program offered by Intact Insurance, good drivers can be rewarded and save even more money on their car insurance. Learn more about the Intact my Driving Discount savings program.